This place was amazing. We started our day out quite a bit later than I would have liked. I mean, our friends were just ordering breakfast when we should have been arriving. There’s no way to herd cats. It was fine. I can just be a little bit antsy, especially knowing that the more popular the attraction, the larger quantity of ‘come-buys’ there will be. There’s just not much ‘hurry up’ with this group of friends…jaja. Okay, so we get everyone fed and take the metro heading towards Autobus de Norte. The bus station was easy to navigate. In 2018, the round trip for the bus was 104 pesos/person (about $6). Mexico City has one of the least expensive metros in the world at 5 pesos. Twice we had patrons on the platform use their metro card for us and didn’t even want us to pay them back. CDMX (Mexico City) gets a bad rap for violence and crime, but we found that it was full of very friendly people. Now that I’m coming back to edit this post, could those men have used stolen cards?! Nah, I won’t let myself believe that. The bus drops us off around 11, half a kilometer from the archaeological site, in the outskirts of town, among restaurants, trinket shops, and street vendors. Let the gauntlet begin … oh no, it really did begin. Did all of our friends really just split up? We haven’t even got to the site yet!! Another 30 minutes, everyone gets hats and rounded up to buy tickets to enter the pyramids. I can be impatient and it’s starting to show. Not only are we now just walking in at 12, but every local vendor has now been able to meander in and set up shop. It’s funny to see our friends’ reactions when we first enter because all the vendors are selling little jaguar whistle statues that when blown through correctly, mimics the sound of a jaguar. I can only imagine how many actual jaguars are circling the perimeter wondering why this has been chosen as the meeting ground of so many juvenile cats, especially with so many tourists around. I think that my friends are joking when they each start to consider buying one, but ‘hey’ if the ‘come-buys’ are still hawking them they must actually move some units. The Pyramid of the Moon and surrounding mountains. This archaeological site is one of the most well preserved that we have explored in Mexico. It’s quite easy to visit the entire place in just a few hours or spend the whole day here, and I would really suggest hiring a guide. The federally licensed guides would’ve kept us all together for a cost of about 600-800 pesos, and that’s a per group pricing. If we had done that with our group it would’ve been around 100 pesos ($5)/ person. It’s totally worth it to learn from them. We did read all of the placards, and the Teotihuacan cultural museum located on site was well done and very informative. It is necessary to keep a hold of your ticket in order to enter the museum. We lost ours, but luckily the man at the entrance was in a good mood and let us through. I’m so glad he did, the artifacts on display were amazing. The obsidian tools, and statues and pottery, all very well preserved and documented. The temples and the grounds have always been looked at as a holy site. The Aztecs were some of the first to discover Teotihuacan after it had been in ruins, yet they continued to honor the temples of the gods. Our friend, Desiree, climbing the Pyramid of the Moon at Teotihuacan near Mexico City. 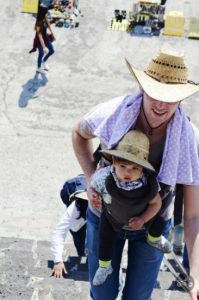 Desiree’s husband and daughter climbing the Pyramid of the Moon at Teotihuacan near Mexico City. I can say that the vendors not to miss are the paletas slingers. Those things were awesome. We are not sweet tooth people, but seeing them in the hands of every other person we started to drool a bit. Made with real fruit, and not too overly sweet, like most popsicles, they were good on a sunny afternoon. Julien got a guava lime mix, and mine was raspberry, something or another. They both had real fruit, they were big, and I’m not sure why we were so in love with them but clearly, they made the post. You won’t find them in a cooler either, as a vendor passed us he just said paletas, and it suddenly dawned on us that was the word for a popsicle. He pulled the paleta out of a heavily iced, clean, trash bag. Never would have found him otherwise. We were looking around for a guy with a cooler. In all, this was a great archaeological site to visit. It’s easy to see the whole thing in just a few hours and if you’re staying in central Mexico City or the popular Roma and Condesa neighborhoods, it will take about an hour and a half to reach, three hours to explore all the buildings, climb the temples, linger at the top, take pictures, eat a popsicle, visit the museum, and say yes or no to all the hawkers. You can take your time too, but if you’re limited on time in the area, and want to see more than one thing in one day this is an easy one to do, just get there at 9:00, and you’ll be back downtown by 2:00. Using the metro, take Yellow Line 5 towards Politecnico and get off 3 stops before the end at Autobuses del Norte. 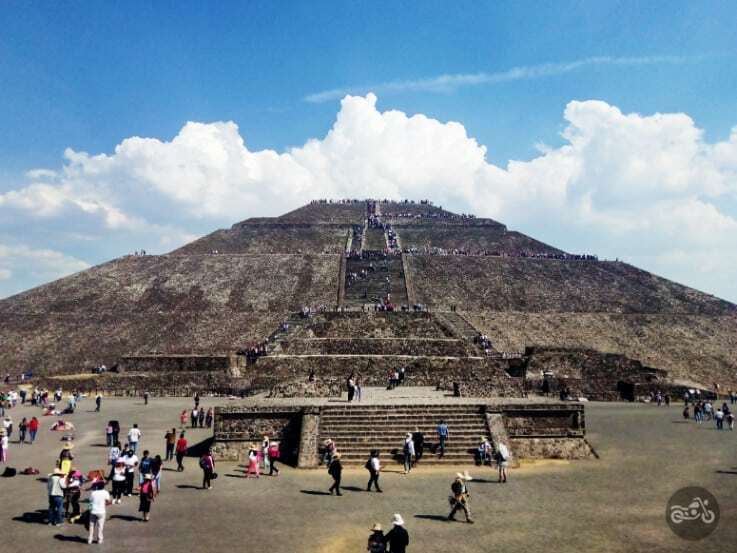 When the bus arrives at Teotihuacan, walk towards the Pyramid of the Sun and the ticket booth will be on your left. The cost to enter is 70 pesos. 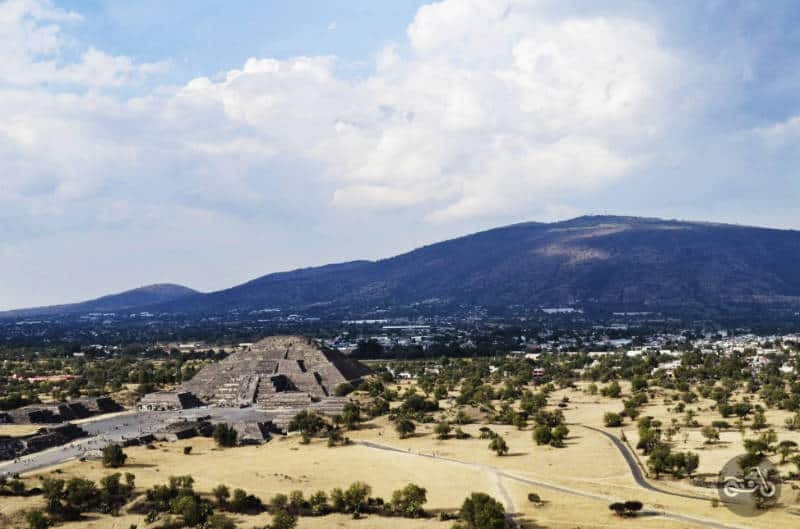 At its height, Teotihuacan was one of the largest cities in the ancient world with an estimated population of over 125,000. 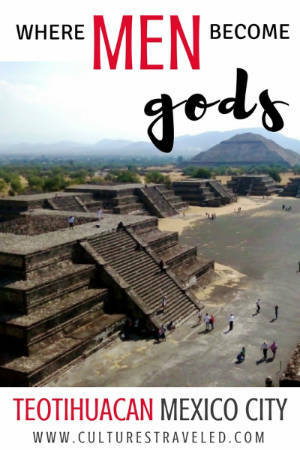 Known for some of the most architecturally significant pyramids built in the pre-Columbian era, most notably the Temple of the Sun and Temple of the Moon. Priests were the only ones allowed to climb the pyramids for rituals and ceremonies. Along the Avenue of the Dead, the pyramids align in the perfect distance of each of the orbits of the planets in our solar system, significantly with the Pyramid of the Sun in the center.